The stock market has historically been more volatile than corporate earnings, but uncertainty can justify that volatility. Nobel Laureate Robert Shiller once argued that market prices are more volatile than they should be, based on changes in future dividends. That perspective is intuitive. But is it true? While the market probably doesn't always get prices right, a more careful look at historical earnings suggests that the volatility in stock prices is justified on average. A stock's intrinsic value is the present value of its future cash flows plus its current cash balance minus debt. These cash flows are risky because they represent the cash that is left over at each firm after all the bills are paid, including interest payments to bondholders, who get paid before equity investors. Given the large impact of cash flows on fundamental value, it might seem like stock prices should be roughly as volatile as their firms' cash flows. But investors don't know what those cash flows will be ahead of time and that uncertainty is a source of added volatility. Stock prices reflect the market's best estimate of what each firm's future cash flows will be, and those estimates change over time. But uncertainty around those estimates can change too, which influences the discount rate investors use to discount those cash flows. This is the compensation investors require for equity risk, known as the equity risk premium. This risk premium is countercyclical -- investors require greater compensation for risk during contractionary periods in the business cycle and less compensation when business is good. When discount rates rise, stock prices fall. That means that this adjustment causes stock prices to fall more than their earnings during bad times and rise more than earnings when times are good, magnifying stock volatility relative to earnings. Interest rates also influence stock discount rates, but they tend to be procyclical (increasing during strong economic environments and decreasing in recessions), which partially offsets the countercyclical impact of the equity-risk premium on prices. However, this effect is likely weaker than equity-risk premium because investors' taste for equity risk is almost certainly more volatile than their bond-risk tolerance. Together, changes in the market's estimates about future cash flows and discount rates can justify stock-price volatility that exceeds the volatility of their cash flows. From the end of 1969 through June 2018, stock returns in the U.S. and international developed markets have, in fact, been a bit more volatile than earnings, as Exhibit 1 shows. Now, reported earnings aren't the same as cash flows. Earnings reflect when revenue is recorded and expenses are recognized, not necessarily when cash is received or expenditures are made. For example, if the firm extends credit to help a customer finance a purchase, it would recognize the sale as soon as it delivers the product, which increases earnings, but it wouldn't see the cash until the customer makes the payments. Earnings can be more easily managed than cash flows. Managers can change some of their accounting choices, like depreciation assumptions, to report higher or lower earnings. This can either induce a smoothing effect, where managers seek to mitigate the apparent volatility in their business, or cause earnings to appear more volatile than cash flows. Managers may be tempted to recognize all the bad things together when they are already going to miss expectations, and become increasingly aggressive with their accounting assumptions to keep up with or beat Wall Street's expectations when times are good. That said, earnings should be a decent proxy for cash flow for the market as a whole over the long term. 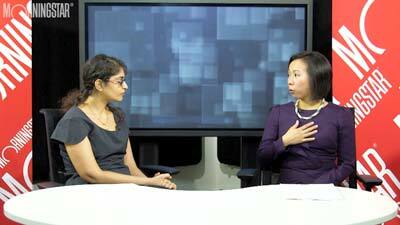 Is the market's volatility justified? It isn't surprising that market prices have been a little more volatile than earnings because investors don't know what future earnings will be and the compensation they require for that risk changes over time. The market discount rate isn't directly observable because future cash flows are unknown. But it is possible to infer how investors have historically dealt with that uncertainty by calculating the implied discount rate from market prices and future earnings. This is an approach outlined by Aswath Damodaran, a professor of Finance at New York University. To calculate the implied discount rates, we calculated the internal rate of return embedded in the market price of each index based on the earnings of its constituents over the next five years and a 2% terminal growth rate. Of course, investors didn't know what those earnings were going to be ahead of time. The implied discount rates are estimates of the amount of compensation they demanded for that uncertainty at each point in time. 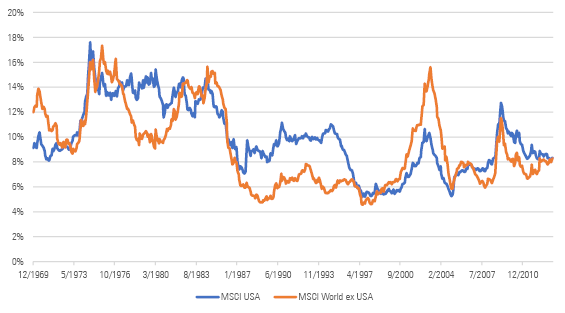 Exhibit 2 shows the results for the MSCI USA and developed-market-focused MSCI World ex USA indexes. The average implied discount rates for U.S. and international developed-markets stocks were 9.88% and 9.18%, respectively, from December 1969 through June 2013. Not surprisingly, those rates tended to increase during market downturns, like in the early 2000s and during the 2008 financial crisis, and decrease during market rallies. While there is an argument that discount rates shouldn't have gone up as much as they did during market downturns, or down so much during rallies, these fluctuations aren't clearly irrational. They reflect changes in the level of risk in the market and investors' willingness to bear that risk. Think back to the financial crisis. With stock prices tumbling, did you take risk off the table as expected returns climbed? Do you feel more comfortable with risk now that the market feels less scary and expected returns are lower? If so, you've got company. Fear and greed contribute to market volatility. They may create opportunities for investors who require a different amount of compensation for risk than the market, but market volatility is not irrational, and it does not serve up free lunches. Rather, market volatility reflects changes in stocks' fundamental value in the presence of uncertainty. The market isn't crazy after all.